Presented as a lightbox (in Polish translation) at the Bęc Zmiana Foundation in Warsaw, 2011, during the conference “Labour of the Multitudes” organized by the Free/Slow University Warsaw. 1. Oikotic responsibility — Artists work in and produce for an economy. When we examine ‘economy’ from its etymological origins: oikonomia (household management), we can locate it in the private sphere. The oikos, the household from which oikonomia derives not only signifies the ‘putting-a-roof’ over ones head, as in financial subsistence. More importantly, the household delineates the various actors, practices, situations, influences and interminglings the artist forges, absorbs, rejects and interacts with. The household of the artist is the space of/for thought, dialogue and production, viz., praxis. 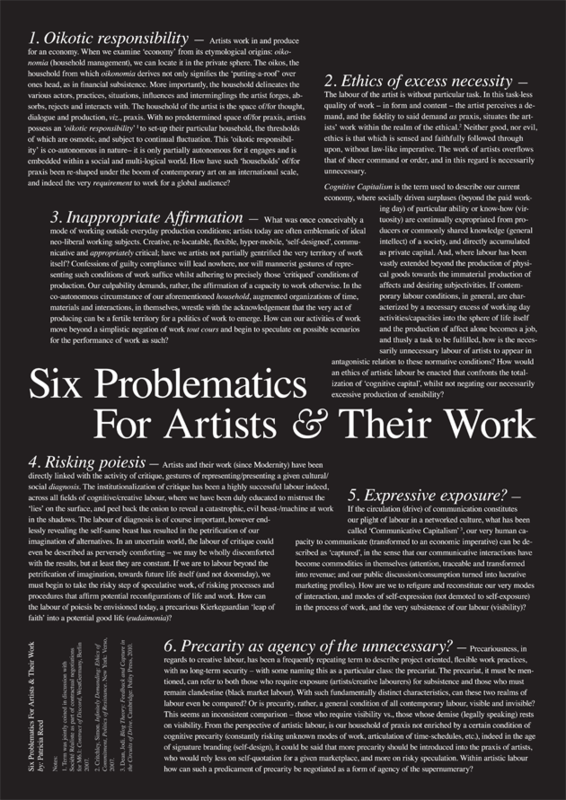 With no predetermined space of/for praxis, artists possess an ‘oikotic responsibility’ (1) to set-up their particular household, the thresholds of which are osmotic, and subject to continual fluctuation. This ‘oikotic responsibility’ is co-autonomous in nature– it is only partially autonomous for it engages and is embedded within a social and multi-logical world. How have such ‘households’ of/for praxis been re-shaped under the boom of contemporary art on an international scale, and indeed the very requirement to work for a global audience? 2. Ethics of excess necessity — The labour of the artist is without particular task. In this task-less quality of work – in form and content – the artist perceives a demand, and the fidelity to said demand as praxis, situates the artists’ work within the realm of the ethical. (2) Neither good, nor evil, ethics is that which is sensed and faithfully followed through upon, without law-like imperative. The work of artists overflows that of sheer command or order, and in this regard is necessarily unnecessary. Cognitive Capitalism is the term used to describe our current economy, where socially driven surpluses (beyond the paid working day) of particular ability or know-how (virtuosity) are continually expropriated from producers or commonly shared knowledge (general intellect) of a society, and directly accumulated as private capital. And, where labour has been vastly extended beyond the production of physical goods towards the immaterial production of affects and desiring subjectivities. If contemporary labour conditions, in general, are characterized by a necessary excess of working day activities/capacities into the sphere of life itself and the production of affect alone becomes a job, and thusly a task to be fulfilled, how is the necessarily unnecessary labour of artists to appear in antagonistic relation to these normative conditions? How would an ethics of artistic labour be enacted that confronts the totalization of ‘cognitive capital’, whilst not negating our necessarily excessive production of sensibility? 3. Inappropriate Affirmation — What was once conceivably a mode of working outside everyday production conditions; artists today are often emblematic of ideal neo-liberal working subjects. Creative, re-locatable, flexible, hyper-mobile, ‘self-designed’, communicative and appropriately critical; have we artists not partially gentrified the very territory of work itself? Confessions of guilty compliance will lead nowhere, nor will mannerist gestures of representing such conditions of work suffice whilst adhering to precisely those ‘critiqued’ conditions of production. Our culpability demands, rather, the affirmation of a capacity to work otherwise. In the co-autonomous circumstance of our aforementioned household, augmented organizations of time, materials and interactions, in themselves, wrestle with the acknowledgement that the very act of producing can be a fertile territory for a politics of work to emerge. How can our activities of work move beyond a simplistic negation of work tout cours and begin to speculate on possible scenarios for the performance of work as such? 4. Risking poiesis — Artists and their work (since Modernity) have been directly linked with the activity of critique, gestures of representing/presenting a given cultural/social diagnosis. The institutionalization of critique has been a highly successful labour indeed, across all fields of cognitive/creative labour, where we have been duly educated to mistrust the ‘lies’ on the surface, and peel back the onion to reveal a catastrophic, evil beast-/machine at work in the shadows. The labour of diagnosis is of course important, however endlessly revealing the self-same beast has resulted in the petrification of our imagination of alternatives. In an uncertain world, the labour of critique could even be described as perversely comforting – we may be wholly discomforted with the results, but at least they are constant. If we are to labour beyond the petrification of imagination, towards future life itself (and not doomsday), we must begin to take the risky step of speculative work, of risking processes and procedures that affirm potential reconfigurations of life and work. How can the labour of poiesis be envisioned today, a precarious Kierkegaardian ‘leap of faith’ into a potential good life (eudaimonia)? 5. Expressive exposure? — If the circulation (drive) of communication constitutes our plight of labour in a networked culture, what has been called ‘Communicative Capitalism’ (3), our very human capacity to communicate (transformed to an economic imperative) can be described as ‘captured’, in the sense that our communicative interactions have become commodities in themselves (attention, traceable and transformed into revenue; and our public discussion/consumption turned into lucrative marketing profiles). How are we to refigure and reconstitute our very modes of interaction, and modes of self-expression (not demoted to self-exposure) in the process of work, and the very subsistence of our labour (visibility)? 6. Precarity as agency of the unnecessary? — Precariousness, in regards to creative labour, has been a frequently repeating term to describe project oriented, flexible work practices, with no long-term security – with some naming this as a particular class: the precariat. The precariat, it must be mentioned, can refer to both those who require exposure (artists/creative labourers) for subsistence and those who must remain clandestine (black market labour). With such fundamentally distinct characteristics, can these two realms of labour even be compared? Or is precarity, rather, a general condition of all contemporary labour, visible and invisible? This seems an inconsistent comparison – those who require visibility vs., those whose demise (legally speaking) rests on visibility. From the perspective of artistic labour, is our household of praxis not enriched by a certain condition of cognitive precarity (constantly risking unknown modes of work, articulation of time-schedules, etc. ), indeed in the age of signature branding (self-design), it could be said that more precarity should be introduced into the praxis of artists, who would rely less on self-quotation for a given marketplace, and more on risky speculation. Within artistic labour how can such a predicament of precarity be negotiated as a form of agency of the supernumerary? 1. Term was jointly coined in discussion with Société Réaliste as part of contractual negotiations for M6.1: Contract of Discord, WestGermany, Berlin 2007. 2. Critchley, Simon. Infinitely Demanding: Ethics of Commitment, Politics of Resistance. New York: Verso, 2007. 3. Dean, Jodi. Blog Theory: Feedback and Capture in the Circuits of Drive. Cambridge: Polity Press, 2010.